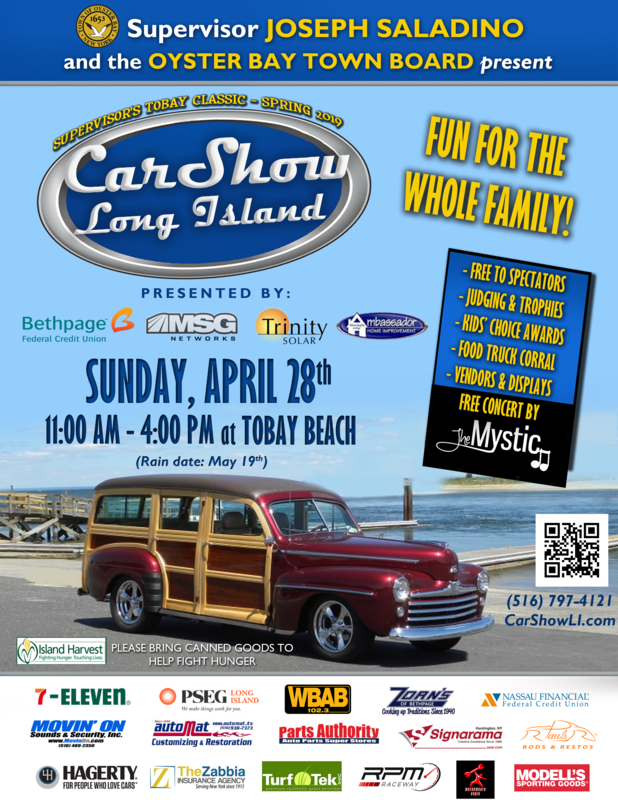 Oyster Bay Town Supervisor Joseph Saladino and the Town Board today announced that a premiere car show will take place on Sunday, April 28th from 11am to 4pm at TOBAY Beach. Car Show Long Island’s 2019 Spring Classic will feature hundreds of automobiles, trucks, military vehicles, and emergency service vehicles. A live concert performed by The Mystic will take place during the day, followed by trophy presentations. The event is free for spectators. Trophies will be awarded in ten categories including best-of-the-best, and children will have a say when deeming which rides are their favorites in the Kids’ Choice Award. Car Show Long Island’s 2019 Spring Classic is made possible through our presenting sponsors: Bethpage Federal Credit Union, MSG Network, and Trinity Solar. Additional sponsors include: PSEG-LI, Zorn’s of Bethpage, Movin’ On Sounds, Parts Authority, Nassau Financial Federal Credit Union, Zabbia Insurance Agency, Hagerty, Insurance, Paul’s Rods and Restos, RPM Raceway, Turf Tek USA, Modell’s Sporting Goods, MotorMouth Radio, 7-Eleven and WBAB 102.3. Enthusiasts and spectators can also grab a bite to eat from one of the many food trucks participating in Car Show Long Island’s 2019 Spring Classic. Car owners can pre-register their vehicles at www.carshowli.com for $15 per car or register the day-of for $25 per car. The rain date for the event is May 19, 2019. The event is free to spectators who are asked to bring two cans of food to donate to Island Harvest, the largest hunger relief organization on Long Island. For more information or to become a sponsor of the event, call (516) 797-4121 or e-mail carshowli@oysterbay-ny.gov.